Luminosity painting has always been one of my favorite methods for using luminosity masks. 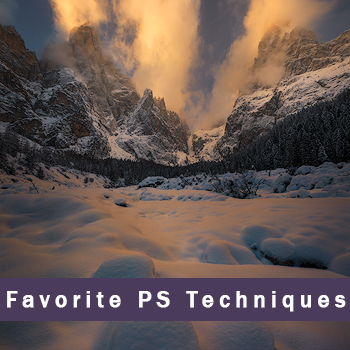 Painting through luminosity selections has significantly more power to influence image tone than using luminosity masks as layer masks, especially when it comes to burning and dodging. Not only does luminosity painting target specific tones in the image to receive paint, but paint can be applied repeatedly with multiple brushstrokes to enhance the effect. Luminosity layer masks limit what can be achieved by what the mask will reveal. Luminosity painting does not have this constraint. Paint can be applied repeatedly even through partially selected pixels until maximum white or maximum black is achieved if necessary. Plus, the active luminosity selection insures it all blends in with the rest of the image regardless of how much paint is applied. So there is much greater effect possible with luminosity painting on burn/dodge layers compared to using layer masks. Not all images need the enhanced effect that luminosity painting can achieve, but using it instead of a luminosity layer mask insures that dynamic control isn’t throttled by what a layer mask can reveal. Sean’s newest quick tip video shows how easy and precise luminosity painting can be with the V5 panel. Highlights with contrast and shadows with depth can quickly be painted into an image using this technique. I particularly like the way Sean uses the “Pick” tool to find the best off-center midtone (Zone) mask to paint through. This is definitely one of my favorite tips so far since it’s something I use on almost every image. I hope you enjoy it too. Be sure to subscribe to Sean’s YouTube channel to keep up with his latest technique videos. 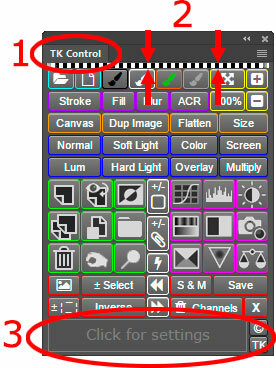 First off, a big “THANK YOU!” to everyone who as emailed suggestions for improving the TKActions V5 panel. Lots of good ideas out there that I would not have thought of on my own. The panel has been updated to incorporate many of them into the CC version. A download of the updated version was emailed to V5 customers on April 22 and 23. Please check your junk/spam email folder for those dates if you didn’t receive it yet. 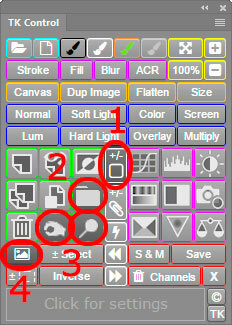 I’m also excited that there are more updates planned for the V5 panel in the coming months, some even for the CS6 version. Customers who have purchased the V5 will receive them for free, so be sure to watch your email and this blog for additional information. If you would like to purchase the V5 panel, it is available on the Panels & Videos page. NOTE: The current update is only for the Photoshop CC version of the panel. 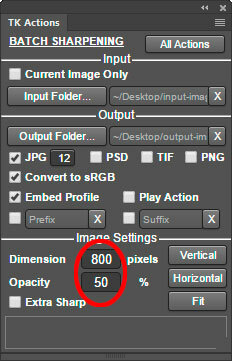 Most of the enhanced features cannot be programmed into the CS6 version. Below is a quick review of the new features listing details and advantages. The original function of each button remains unchanged. What’s new are the enhanced functions accessed by pressing a modifier key when clicking a particular button on the panel. The “ALT” key on Windows (“option” key on Mac) is the most frequent modifier. This is designated as “ALT/option” in the text below. The “Shift” key is also occasionally used as is the “CTRL/control” key (Windows-“CTRL” / Mac-“command”). 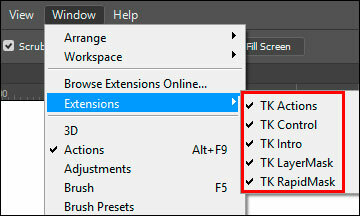 “TK” appears in front of the module names in the Window > Extensions menu in Photoshop and on the module’s tab. This makes it easier to find the V5 modules in the “Extensions” list if the user has multiple extension panels installed. The animated active selection indicator is slightly taller. This is subtle but provides slightly better visibility when the “Animated” indicator is chosen. The “Fixed” selection indicator (red dashes) has not changed. Theme-matched rollover Help. 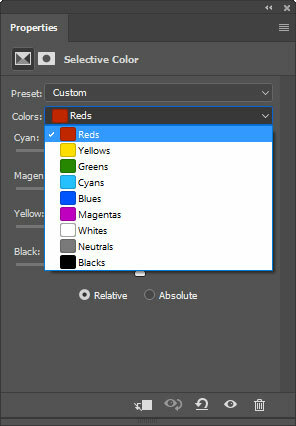 This provides a much cleaner look to the modules that blends better with the overall theme chosen as the Photoshop interface. The Help messages still appears in the window at the bottom of each module, but this window is no longer a distracting white box. 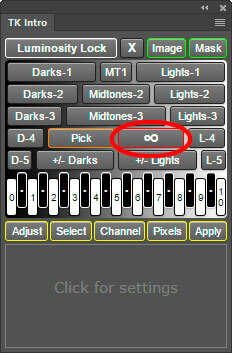 +/- Layer Mask button: ALT/option adds a black (hide-all) mask on the active layer. Advantage: A black mask makes it easier to paint in adjustments that affect only small parts of the image. 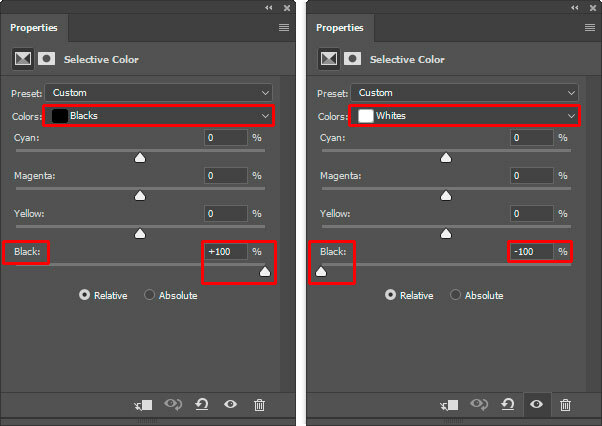 Group button: ALT/option adds a black (hide-all) mask to the Group layer when it’s created. Advantage: A black mask can be useful when using the mask-the-mask technique described in Sean Bagshaw’s videos when only a small portion of an adjustment within the group needs to be revealed in the composite image. Burn/Dodge buttons: ALT/option creates the Burn/Dodge layer filled with 50% gray. Advantage: 50% gray provides better visibility of where paint is applied to the layer. View button: ALT/option opens a Curves adjustment instead of a Levels adjustment for modifying the mask of an active selection. Advantage: Some people prefer Curves to Levels. 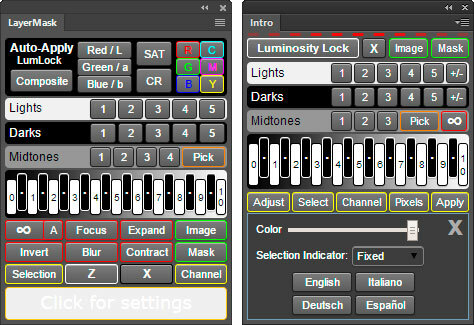 This module has been redesigned to incorporate the “spectrum” interface first introduced in the V4 panel. 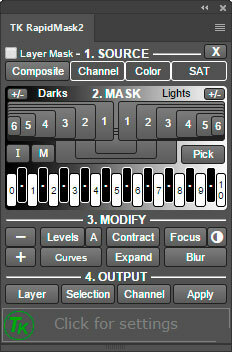 With it, the relative amount of tones selected by each mask is suggested by the location and width of the buttons, which are placed against a tonal gradient background. Wide buttons select more tones, narrow buttons select fewer tones. Advantage: For people new to luminosity masks, this arrangement can help visualize the tonal range of each mask. 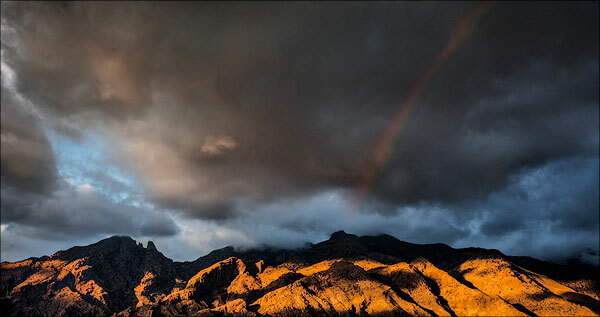 The Intro module continues to use the Luminosity Lock/Rapid Mask engine for generating luminosity masks, so the power, speed, and mask-based interface are all still available when using this module. 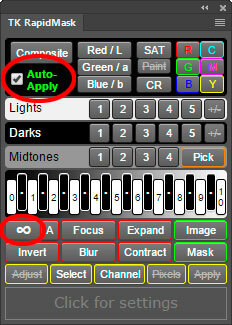 Infinity (∞) button: ALT/Option opens a Curves adjustment layer instead of a Levels adjustment layer for modifying the Rapid Mask. Advantage: Some people prefer Curves. The black background of the LumLock section now tone-pulses from black to gray then back to black. 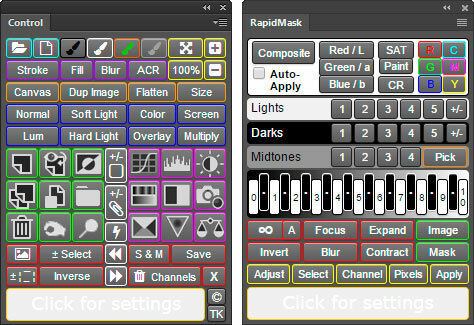 Advantage: Visually more distinct than the previous black background to better distinguish the LayerMask module from the RapidMask module that has a similar layout. 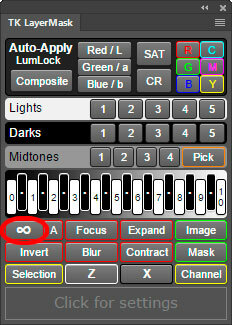 Infinity (∞) button: ALT/option opens a Curves adjustment instead of Levels. 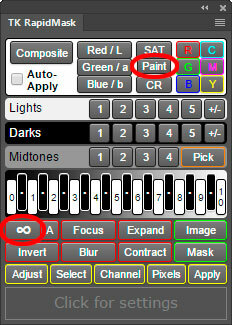 Paint button: ALT/option just resets brushes for saturation painting without creating a new layer. Advantage: Makes it easier to return to the Saturation Painting layer to update it. Infinity (∞) button: ALT/option opens a Curves dialog window instead of Levels. Enhanced visibility when “Auto-Apply” is checked. 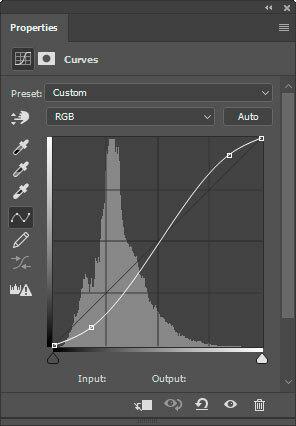 The words “Auto-Apply” change to green and the black background tone-pulses from black to gray. Advantage: Better distinguishes when “Auto-Apply” is turned on. Clarity button: ALT/option runs the action on a Smart Object layer. Advantage: Allows the blur radius to be changed later. This is done by double-clicking the “High Pass” filter on the Smart Object layer and entering a different Radius value. 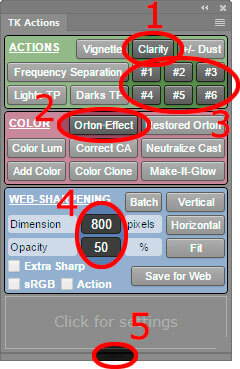 Orton Effect button: ALT/option runs the action on a Smart Object layer. Advantage: Blur can be readjusted later as needed by double-clicking Gaussian Blur on the Smart Object layer. a)	ALT/option-click opens a window that allows the user to change the button’s name. Advantage: Easier to remember the action associated with each button. b)	CTRL/command-click opens a window that allows the user to change the button’s rollover Help message. Advantage: A more descriptive message about the action programmed into this button can be entered. c)	Shift-click restores the default name and rollover Help for the button. Larger font size for the “Dimension” and “Opacity” fields. Advantage: Easier to see on high-resolution monitors. Better stacking capability for smaller monitors via a workaround that fools Photoshop into believing the panel is shorter than it is. Larger font size for the “Dimension” and “Opacity fields. 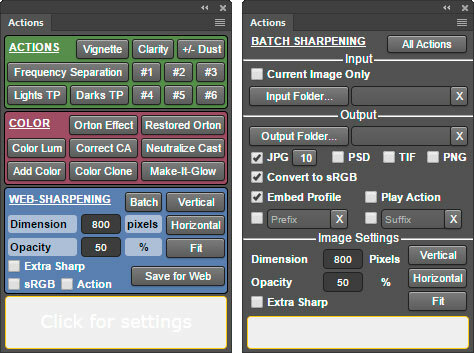 Multi-dimensional batch web-sharpening is now available. If images need to be output to different sizes, multiple dimensions can be entered in the “Dimension” field. It’s just necessary to separate each value with a semicolon and have no spaces. Example: 800;1024;2048. Using this example, three images will be output for every input image, each having one of the three listed dimensions: 800-pixels, 1024-pixels, and 2048-pixels. The action adds a suffix to each image listing the dimension to which it has been sized. I hope you find these enhancements useful. More to come, so stay tuned.